Property prices in the luxury condo segment in Singapore have made a strong comeback in 2018 as the nation’s real estate market continues to “play catch-up” to other prominent global cities such as Hong Kong, New York, and London. In 2018, the top 10 highest priced luxury condominiums in Singapore ranged from SS$16.8 million to a whopping S$36.28 million – well above the range recorded in 2017 (S$16.02 mil to S$25.58 mil). Based on stats and figures extracted from the Urban Redevelopment Authority (URA) of Singapore for the Core Central Region (CCR), here are the top 8 luxury condominiums sold in 2018. Being possibly one of the most iconic luxury real estate under the portfolio of property developer City Developments Ltd (CDL), the 124-unit New Futura was the best selling high-end freehold condo in 2018. Launched in early January, a total of 97 units has already been snapped up within a year. Units were sold at an average per square foot (psf) price of S$3,427. The highest price attained for a luxury condo in the CCR was, in fact, at New Futura. Its 5-bedroom penthouse (7,836 sq ft) was sold at a staggering S$36.28 million or S$4,630 psf – back in May 2018. This transaction was ranked not only the highest in terms of the absolute purchase price but also per square foot price. There are only 2 of such penthouses in New Futura and each had an initial asking price of S$39.8 million (S$5,079 psf). The main draw of New Futura would be its excellence in location – right at the heart of the prime district 9 in Singapore along Leonie Hill. It’s situated practically next to Orchard Road, the biggest shopping district in the country which comprises some of the most iconic malls such as ION Orchard, Ngee Ann City, and Paragon. According to the breakdown of buyers’ profile provided by the URA, around 28.9% of the purchases were made up by foreigners. Completed back in 2016, Gramercy Park was one of the most talked-about freehold luxury condo developments over the last 2 years. In July 2017, it made headlines by having one of its 4 penthouses sold for $17 million. It was a 2-storey penthouse with a total built-in area of 5,533 sq ft and the psf price works out to be S$3,073 psf. A couple months later in February 2018, Gramercy Park has again sold another one of its bigger 5-bedroom penthouse units (7,287 sq ft) for an overwhelming sum of S$24.5 million or S$3,362 psf – making this transaction the 2nd highest in terms of the absolute amount for the whole of 2018. Gramercy Park, also constructed by CDL comprises a total of 174 units, ranging between 2 to 4 bedroom unit types and is almost fully sold. It is located within close proximity to Orchard Road as well. Located within one of the most prestigious residential estates of Singapore, Bishopsgate Residences is probably one of the underrated properties among the bunch. Most affluent buyers, especially the locals would agree that buying property within the area is like buying art. Thus, this is an area where you will find private homes which belong to some of the wealthiest people in Singapore – and some of the most astounding landed properties as well. Lavishness, space, and exclusivity do come at a hefty price as its 4-bedroom triplex unit (6,641 sq ft) at Bishopsgate Residences was sold at a whopping S$24 million or S$3,614 psf in November 2018. This transaction sets a historical high within Bishopsgate Residences in terms of overall quantum. Apparently, the highest psf price ever recorded was also coincidentally within the same year (in July) at S$3,913 psf. It was for one of the 4-bedroom units (2,939 sq ft) and it was sold at S$11.5 million. The evergreen upscale residential enclave of Nassim has always been one of the top favorites among luxury home buyers in Singapore. Since it was completed in 2011, transactions at the 100-unit Nassim Park Residences were concluded at an estimated average price of S$13.07 million or S$3,208 psf. In June 2018, a 6,932-sq ft 5-bedroom penthouse unit was sold at S$20.8 million or S$3,001 psf. The previous owner was, in fact, the first owner of the property and purchased the penthouse at Nassim Park Residences for around S$18.3 million or S$2,671 psf almost a decade ago – back in August 2008. According to records, the highest priced unit ever sold at Nassim Park Residences was for a 4-bedroom penthouse (6,878 sq ft) at $27.52 million. That equates to a whopping S$4,001 psf (which is second to the highest psf of S$4,120 recorded in July 2010). Not only is Nassim Park Residences being well-known for the fact that it was developed by UOL Group and designed by renowned high-end architect firm SCDA architects, but price movement within the condo has shown extreme resilience. Median psf prices of transactions have been maintained at above the $3,000 psf mark despite several rounds of property curbs introduced since 2010. Staying within the Nassim precinct, the next luxury condominium project which made it into the rankings is The Nassim by CapitaLand. A 5-bedroom duplex unit with a massive built-in area of 7,061 sq ft was sold for S$19.6 million or S$2,776 psf in January 2018. According to data from URA, The Nassim has been very well-received in 2018. A total of 21 units have been transacted in total at an average of S$3,381 psf. The Nassim was completed in 2015 and it comprises only 55 exclusive units. Back in January 2017, Mr. Wee Cho Yaw, one of Singapore’s wealthiest personnel purchased a bulk of 45 units in total for around S$411.6 million and is reported to have resold most of these units in 2018. It was also noted that approximately 41% of the buyers at The Nassim were made up by foreigners. 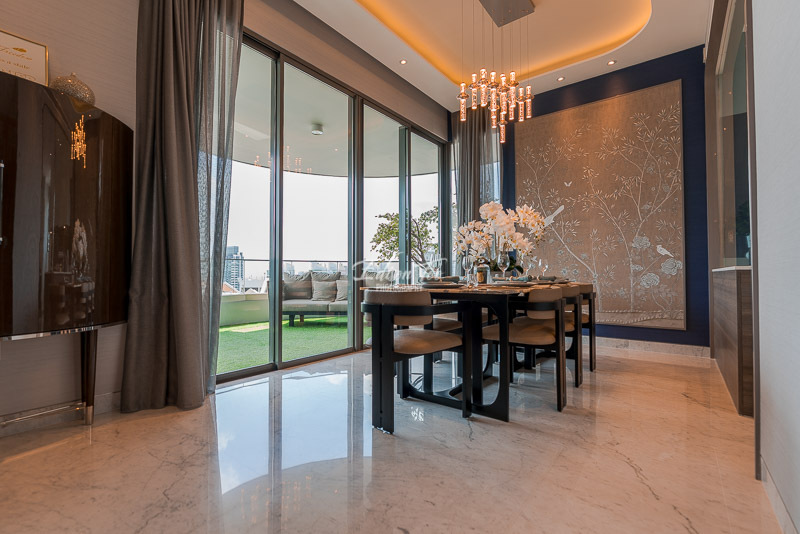 One of Far East Organisation’s most prized collection of high-end private residential projects (the ‘Inessence’ collection) would certainly have to be Boulevard Vue. The luxury condo development prides itself on its unique design for its 28 exclusive apartment units. Each unit at this luxury condo in Orchard spans across a built-in area of close to 4,500 sq ft and the best part – there is only one unit on every floor. In 2018, two transactions at Boulevard Vue made into the top 10 highest priced luxury condo units sold in the CCR. Each unit was sold at S$18.18 million (or S$4,060 psf) and S$18.27 million (or S$4,080 psf) respectively. The highest psf priced unit ever sold at Boulevard Vue was back November 2010 for S$4,800 psf, which was almost 20% higher than today’s price. According to sources to-date, there are only 3 units left for sale at Boulevard Vue condo. The Marina Bay area in Singapore is the fast-growing luxury property segment in Singapore. Ever since The Sail at Marina Bay was launched more than a decade ago, there has been evergrowing buying interest for high-end homes within Marina Bay. Subsequently, more new launch projects came into the scene, such as Marina Bay Residences and Marina Bay Suites; they are all fully sold by developers. The next biggest thing in Marina Bay right now is, in fact, Marina One Residences. This integrated residential and commercial luxury development was not only well-known for its impressive state-of-the-art architecture and housing Facebook’s 260,000 sq ft office, but it’s also a landmark property which symbolizes the strong ties between Singapore and Malaysia. Being developed by the Singapore government’s Temasek Holdings and Malaysia’s sovereign wealth fund Khazanah Nasional. Marina One Residences comprises some of the most beautiful and luxurious condominium units situated in the heart of Singapore’s financial district; overlooking the southern seas. This perhaps helps to explain why the penthouse (6,469 sq ft) at Marina One Residences was sold at a whopping S$18 million or S$2,782 psf in June 2018 – making one of the top luxury condos to be sold within that year. Completing the list would be the sale of a typical 4-bedroom unit (3,907 sq ft) at Le Nouvel Ardmore in May 2018. The luxury condo unit was situated on the 13th floor and was sold for S$16.8 million or S$4,300 psf. What really caught us was the fact that it was purchased using an HDB address – which could on the surface mean the buyer is a Singaporean or permanent resident. Other than the record-holding transaction for 2018, another two units were sold earlier in the year in this 43-unit high-end Le Nouvel Ardmore condo which completed back in 2014. Each of these units was sold at S$16.03 million (S$3,880 psf) and S$15.66 million (S$4,098) in the month of January and May respectively. With a unique ‘Rubik’s cube’-inspired architecture, Le Nouvel Ardmore was a headline-grabber back in May 2015 as its 13,573-sq ft penthouse unit was sold to Alibaba co-founder, Sun Tongyu for a whopping S$51 million or S$3,757 psf.